Then she says: “It would seem that people have done this for years in the process of raising children. JJ: All life forms follows this process in one way or another. The lower life forms help each other instinctively, but humans learn to help consciously beginning with our children. With them we go beyond instinct and consciously decide how we can go about lifting them to a higher level, perhaps even higher than we are. Then there comes a time that we discover the spiritual path, but even this is found through the help and stimulation of another who has found it first. Then after you enter someone pulls your teacher ahead and you take his place and pull others up to where you are. After you have then brought others to the portal you are then given another helping hand until you finish your first major journey on the path. This pushing and pulling continues for eternity, as long as Becoming continues to exist. Let me answer this with another question. Let us suppose you were in a school with twelve grade levels and you had just completed the sixth grade and were ready for the seventh. Now in this grade system you have to complete one grade before you can go to the next. For instance, knowledge from grade six is essential for a successful grade seven. Now let us say that you forgot which grade you had just completed and you had to make a decision as to which grade you had to take. If you chose grade three you would learn nothing new and be bored out of your mind. On the other hand, if you mistakenly thought you were on the last rung of your schooling and picked grade twelve you would fail miserably because you do not have the prerequisite ability and knowledge. Any thought of success at this grade would be pure illusion and waste of time. Thus we can see that in this situation it would be wise for you to honestly examine your place on the path of schooling until you arrive at a true evaluation of where you belong so true progress can be made. It is obvious here if you see yourself as too low or too high then you will waste your time – a year in this analogy and a lifetime or more in our reality. Now some may say that it doesn’t matter if we waste a lifetime or two, but even a wasted day matters to me and I’m sure many of you – so a wasted lifetime is a relative disaster. It behooves us therefore as students along the path to find our correct place and discover the next true lessons we must learn. We must not fall into the temptation of repeating lessons of the past because they are simple, or to tackle lessons we are incapable of comprehending, but to find out true place. What are signs we are not on the path, but below our potential? (2) You will feel like the knowledge you are applying has come to you very easily with little struggle on your part. (3) It will seem like the past had much greater opportunities than the present. (4) You will yield up your thinking ability to some prophet, priest or guru and believe whatever they say without checking with your own soul or mind, yet you are not satisfied with what you are learning. What are signs we are not on the path, but are trying to be above your potential? (1) You will feel that you have found some ultimate truth or reality. (2) You will not be able to put into words many truths you think you have learned. They are beyond words you will tell yourself and others. (3) You will not be able to put your ultimate experience into words in a way that will even give others even a rough idea as to what you are talking about. (4) Some (but not all) will feel very isolated, as if they are a lone pilgrim on a lonely path and that no one understands their high level. (5) For others the power of the ego will be amplified and the person will never admit he is wrong and tends to speak with greater and greater authority and gets disturbed when his statements are questioned. (6) When he teaches he expects to be believed just because he (or God or some channeled being) says it is correct. (1) You have had to struggle to attain your spiritual knowledge and position, but you feel good about it and would not trade the experience for anything. (2) You have a sense of peace about where you are and where you are heading. 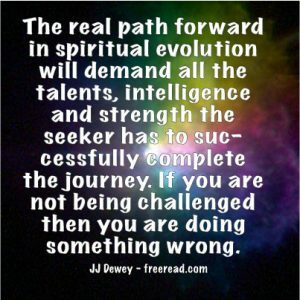 (3) The teachings on Becoming, rather than just Being register strongly with your soul. (4) You receive much help and stimulation from others who have accomplished what you have not. (5) As you look over the last ten years of your life you can see you have grown in spiritual strength and knowledge. (6) You feel a strong desire to learn and move forward. Because of illusion these are not infallible guidelines. They will have the most meaning to those who see their correct place on the path.